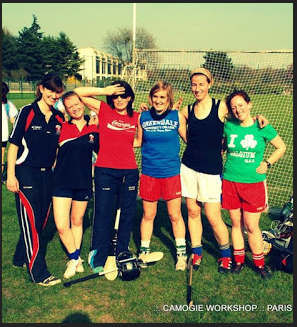 A startlingly warm and sunny Saturday morning in March saw a number of Belgium ladies heading to the Parisian suburbs, to meet with their European cohorts: a well-dressed Luxembourg squad, a lone Zurich ranger and the Paris camogie players, able hosts of the first European camogie workshop. This two-day workshop, 18 months in the making, was the result of organisation between the European County Board and the Camogie Association, and well worth the wait. Three trainers came over from Ireland for the occasion: Caroline Murray (Galway), Siobhán Ryan (Tipperary) and Noel Wilson (Wexford). They saw what they had to deal with, and adapted quickly to the situation. The standards of camogie in Europe vary from those who played in Ireland from an early age to those who just recently picked up a hurley for the first time. Originally planned as a coaching workshop, they reformulated it to suit new and rusty players and coaches of new and rusty players. No more will we dither over the whys and wherefores of camogie: we can now answer questions about the right size hurley and how it should be held (basic questions , but ones that are pretty relevant and usually difficult to answer). We know the best way to plan a training session and how to conduct a good camogie-based warm-up. We have new, fun and challenging drills in mind. And we have books and brochures to back up all this knowledge. Go on, try us! We learned aspects about our own games that will make such a difference during the coming season. For example, this writer now knows that she is a left-handed hurler who plays off her right side, but that she can use both sides to her advantage in a match. We know about not pigeon-holing any player into one position for all time, by playing games where all players rotate positions and diversify their abilities. This will make such a difference when tournaments come around. We have all experienced days when one or two players get injured and the rest of the team is confounded by how to fill their positions. Adaptability has to be the name of the game – we don’t have an endless stream of players, so we need to cultivate the ones that we do have. The issue of recruitment was a subject for discussion throughout the weekend. We discussed how to promote the game: with St. Patrick’s Day or other national day demonstrations, through the media, or by “infiltration” of other sports clubs. The enthusiasm for camogie was clear among all participants, so it can’t be so difficult to extend this passion to other like-minded people back in our own countries. This exchange of ideas between club representatives was not only enlightening, but also a great way to get to know other players. In Europe, we have to leave rivalries on the pitch if we want to ensure the development of Gaelic sports, so interclub communication and understanding is essential. One of the greatest pleasures of the weekend was appreciating the talent of the trainers, even just during a puck around during the lunch break. A good player is one thing, but a good player who can teach others has a skill that should be shared and appreciated wherever they go. Thanks again to the trainers, the hosts and the organisers of the camogie weekend. Roll on the 2012 season and see you all in Den Haag in April!